As the nerd, my task was to do as much research as possible, plan the trip, and set up logistics. Thanks to Google maps and some great historical sites I was able to find the hospital where he was born, his pre-school, and the Quonset hut where his family lived. Could not find where the tent was…but still felt good about what we did find, pre-trip. I felt like Nancy Drew. 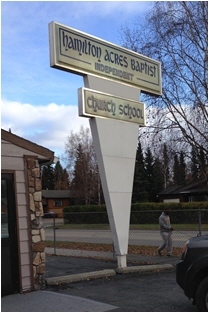 Last month, September, we flew to Fairbanks, Alaska. 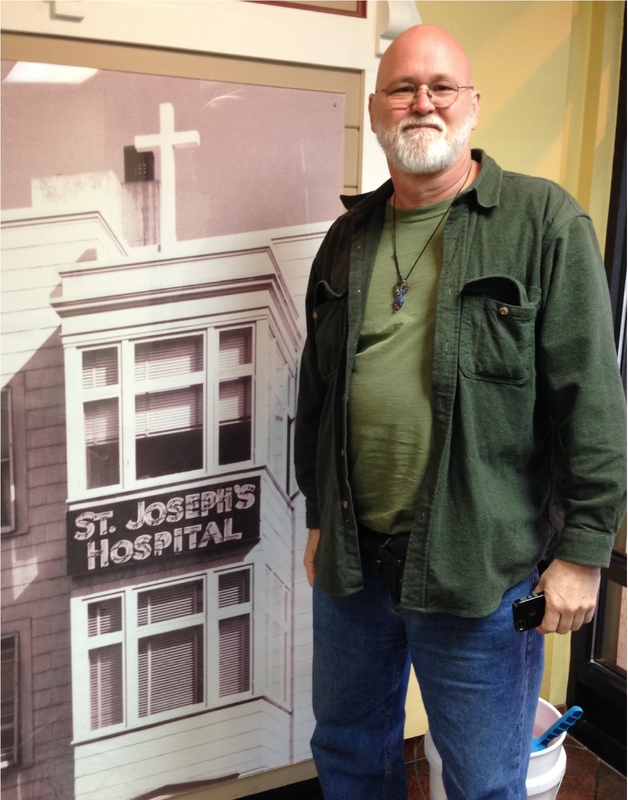 St. Joseph’s Hospital is now a bank headquarters. So many Fairbanks folks were born there that the bank created a lobby that depicted its history. Bank workers would pop their heads in with a “May I help you?” look on their faces. “He was born here,” I’d say. They would nod and be on their way. “That touched me more than I thought it would,” he responded on his return. 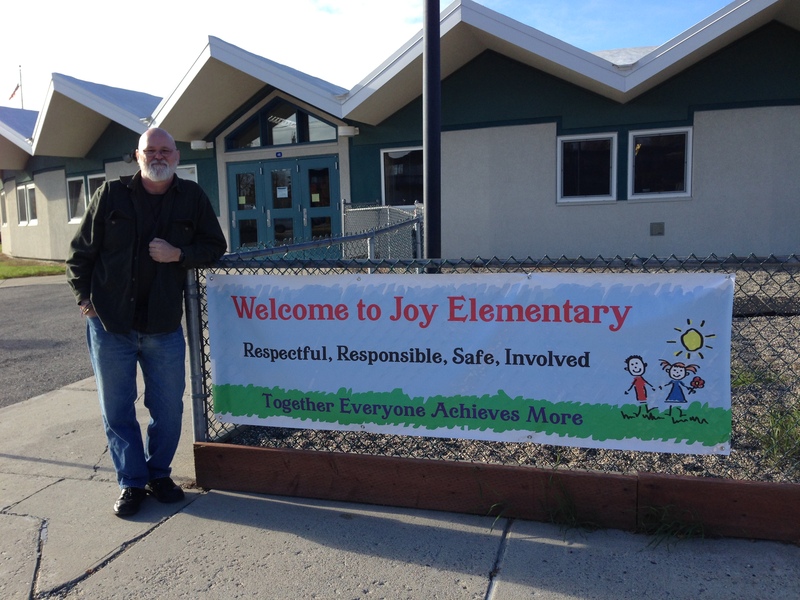 During our pre-trip investigation, Robert said he remembered the school was round and called “Joy” or something. Sure enough, there north of town was a round school. (Thank you, Google maps.) We paid a visit and again, “walked the land.” We stayed outside because we thought it might not be appropriate to walk through the school itself. Robert was more than satisfied. We had an address and found it was not too far from the school. Robert had a picture of his family in the Hut. This must have seemed like a palace compared to the tent. Robert is on the far left. They got water from the neighbors and got along well. Robert and his family lived there for approximately 5 years, with the occasional trip back to Salem Oregon. 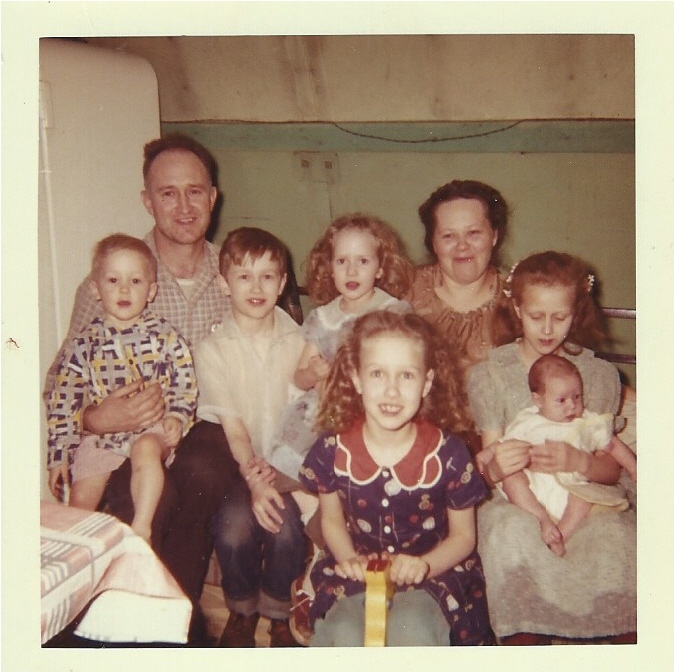 After the last of seven kids was born, Robert’s mom was done with living in the Quonset Hut while her husband traveled Alaska to find carpentry work. They re-located permanently to Salem Oregon, with Robert’s dad traveling twice a year to find work around Alaska. 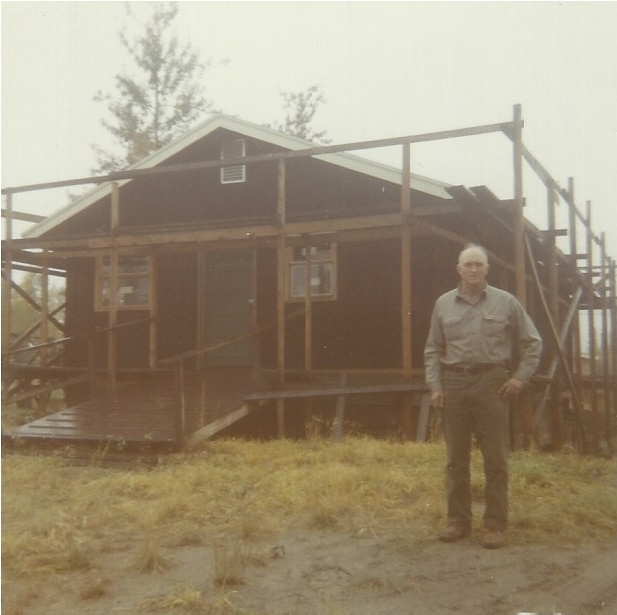 Later his dad built a house over the Quonset Hut and removed the hut from the inside. 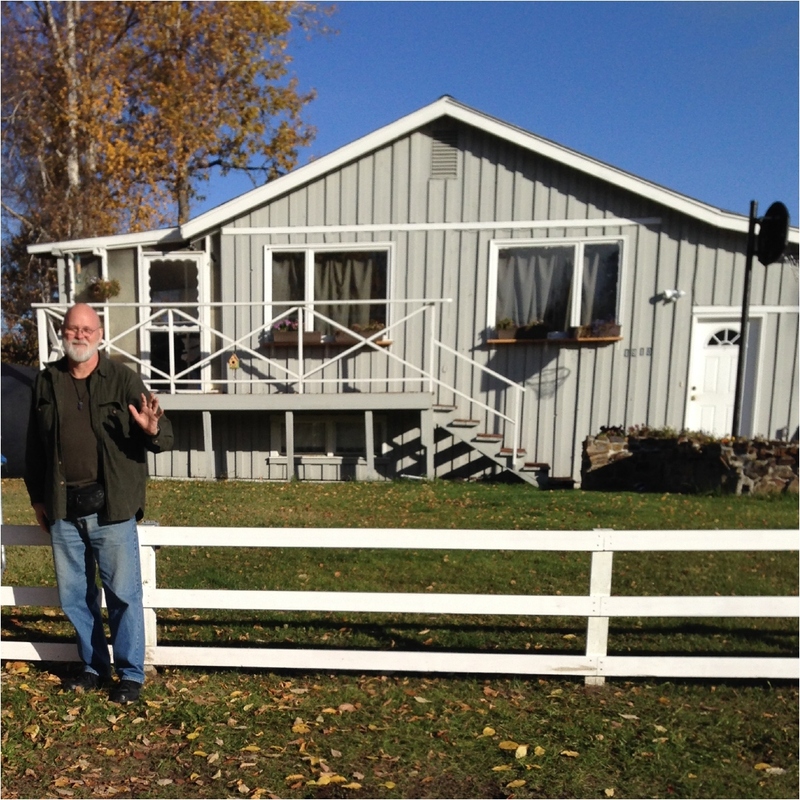 We were confident that we found the house, even with its additions. The owners were kind enough to let Robert do a walk through. Where the heck is Hamilton Acres? We exhausted all the trails we followed pre-trip. Once there, we sought the fine help of the Fairbanks Resource Librarians. Let me just say…Resource Librarians ROCK. They love to learn things and search out information. The birth certificate had an address in Hamilton Acres, which no longer existed. However, I had found Hamilton Avenue. It was near the remembered rail road tracks, but not by what Robert’s family called the dump – (The official city dump was across the river). The Librarians figured out through old maps and some conjecture that Hamilton Acres was the name of a homestead. Often someone would claim land, and then sublet it to those living in tents. Any “dump” was probably something those nearby would use instead of hauling their trash across town. “Hamilton Acres” church. So, what do you do when you find the name you have been seeking for the major part of an afternoon? Why, you go in and see if you can find a minister. Of course that is what Robert did, meeting a second generation minister of Hamilton Acers. 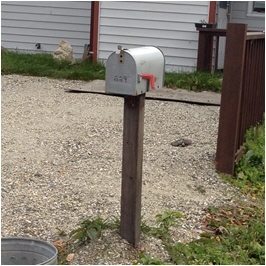 The tent was long gone, and we had no illusion that this was the same mail box. But he found it…229. This is the spot he was taken after being born in the hospital that is now a bank. This is where he lived the first year of his life and where the first picture at the top of this story was taken….a picture I entitled, “Not a Happy Camper.” He was probably just cold, because he holds fond memories of those times, following his brothers and sisters around, having adventures. Robert was content. 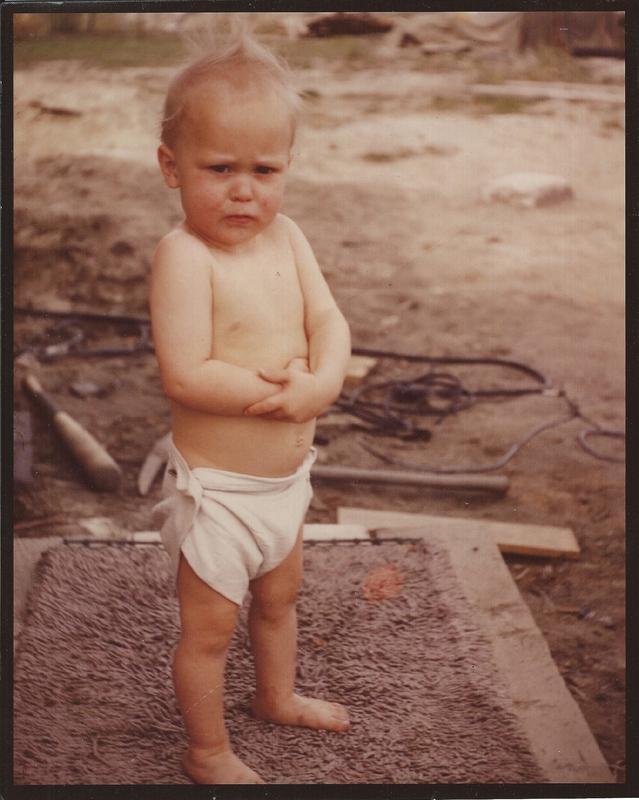 He had flown to Alaska and unraveled mysteries of his early years, meeting helpful and gracious people along the way. He had “walked the land” and was pleased. Thanks, Caroline I’m glad you enjoyed it. Thanks, Myra. I do enjoy the blog format for sharing. Such a wonderful thing to be able to do…go back and visit places from the early days. The pictures are great! Thanks, Angie. The next one comes out tomorrow! I loved this Bobbi. I can see Robert enjoying every bit of this trip. I love your writing style and look forward to reading more!